Zephyr Teachout was using "Float like a butterfly, sting like a bee" as her personal mantra decades before Muhammad Ali's death revived the saying. The Vermont native, endorsed by Sen. Bernie Sanders (I-Vt.) for a U.S. House seat in New York's Hudson Valley, quoted the champ's trope alongside her senior photo in Hanover High School's 1989 yearbook. "A lot of students went with pop song lyrics," recalled Kendra Nordin, Teachout's track team cocaptain at the Upper Valley school. "Zephyr was different. Ali expressed how she saw herself — as a competitor in races." Slender, stylish and charismatic, Teachout floated like a butterfly in her debut race for elected office. A political unknown, she attracted national notice for her chutzpah in challenging incumbent Andrew Cuomo in New York's 2014 Democratic gubernatorial primary. She stung her heavily favored foe as "self-serving" and "corrupt" for having shut down a commission investigating high-level graft in Albany. Crusading against political corruption and corporate influence peddling via campaign contributions has emerged as Teachout's defining issue. She wrote a book on the subject in 2014: Corruption in America — From Benjamin Franklin's Snuff Box to Citizens United. "You have probably heard pundits say we are living in an age of 'legalized bribery'; Corruption in America is the book that makes their case in careful detail," said a review in the New York Times. Cuomo smacked down the upstart in the primary election. But Teachout's 34 percent share of the vote exceeded analysts' expectations and hinted that the Fordham University School of Law associate professor might enjoy a successful future in politics. Polling for the June 28 primary in New York's 19th congressional district suggests that future may arrive soon. Teachout led her Democratic rival, Livingston, N.Y., Town Councilor Will Yandik, by a 53-23 percent margin in a recent survey conducted by Time Warner Cable News and Siena College. She's also far ahead of Yandik in raising funds for a race that the national Democratic Party is eyeing as an optimal opportunity for picking up a Republican-held seat. Teachout reported $530,732 in contributions in a federal filing in April, compared to $256,670 for Yandik. Her haul included donations from Ben Cohen, Vermont's emperor of ice cream; Shelburne philanthropist Crea Lintilhac; and South Burlington photographer Todd Lockwood. That tally didn't include the tens of thousands of dollars that likely fattened Teachout's coffers when Sanders sent out an email blast on April 13 urging his donors to shell out for her. "She understands better than anybody how special interests try to buy off politicians, and she's dedicated her life to fixing our broken political system," the presidential candidate wrote. Teachout declined to divulge how much money she raked in as a result of Sanders' anointment, even though it will be possible to calculate some of that sum in the next scheduled financial filing on June 16. The 44-year-old former Norwich resident also spurned several requests by Seven Days for either an in-person or telephone interview. She did agree to answer via email a question about how her Vermont upbringing influenced her political outlook. Teachout's response was anodyne, however, and avoided any mention of Vermont. "I believe that democracy is founded on respect, and we should always be bringing more people into the political process," she wrote. "I grew up with town board meetings, watching people disagree, agree, and spend hours on whether or not to hire a new police officer, whether the budget needed changing. And no one got more time at the town meeting just because they had more money. Our community was made up of very independent-minded people: Party labels mattered less than independent thinking." In her campaign literature, Teachout similarly avoids associating herself with the state where both her parents live, along with three of her four siblings. A glossy handout says she "grew up in a rural county a few hours north of her current home in Dutchess County." The Cuomo campaign had attacked Teachout as a carpetbagger who failed to meet a New York constitutional requirement that a person must have lived in the state for five years prior to running for office. 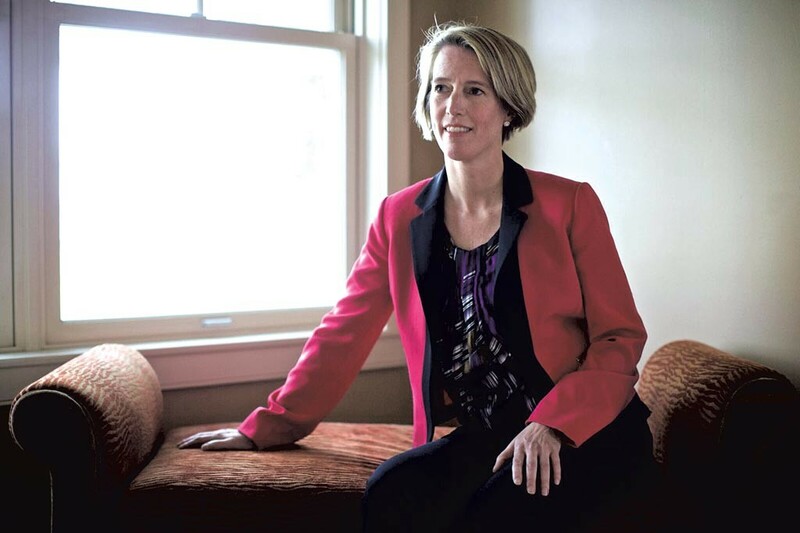 Teachout had moved to New York City in 2009 — five years before the gubernatorial primary — but she acknowledged in a court case initiated by Cuomo that she had spent parts of summers at her parents' home in Vermont. The trial judge ruled in her favor. Teachout is clearly worried that the carpetbagger charge will be leveled against her again. She moved from Brooklyn to a town in New York's 19th congressional district in March 2015 — two months after incumbent Republican Chris Gibson announced that he would not seek reelection. Yandik has so far not called attention to his opponent's status as a Zephyr-come-lately. The closest he got in a June 7 debate in Woodstock, N.Y., was to state — twice — that "local roots matter." Yandik, who manages a farm that his family has owned for 100 years, stakes out progressive positions identical to Teachout's on issue after issue. Both oppose fracking, support a path to citizenship for undocumented immigrants, pledge to address climate change and favor a steep increase in the federal minimum wage. Despite his homeboy cred, Yandik lacks Teachout's name recognition. But he may not prove a pushover in the primary. The boyish-looking 38-year-old holds degrees from Princeton and Brown and comes across as an articulate advocate for the needs of a district that's losing its young people because of a lack of economic opportunities. Yandik is also a schmoozer. He lingered after the Woodstock debate to chat with a few of the 200 or so locals who had packed a community center in a town that retains a '60s vibe. Teachout hurried out of the hall, pausing only to shake hands with a couple of gray-haired hippies while ignoring a reporter's attempts to ask her questions. If she does prevail in the primary, Teachout can expect her likely Republican opponent — former New York State Assembly minority leader John Faso — to hammer her as a hyper-ambitious interloper. And she may choose to mount a defense offered by her father, Vermont Law School professor Peter Teachout, in an interview last week. In explaining the Dutch origins of the family name — an anglicization of Tietsoort — the sixth-generation Vermonter pointed out that some of Zephyr's ancestors settled centuries ago on lands now included in New York's 19th congressional district. The Vermont Teachouts all have distinguished careers and most hold degrees from Ivy League colleges. As an undergraduate, Zephyr was editor in chief of the Yale Daily News magazine. She later earned graduate degrees from Duke University in both law and political science. Her mother, Mary Miles Teachout, serves as the presiding judge on Washington County Superior Court. Zephyr's older sister, Woden, who lives in Middlesex, earned a PhD in American history at Harvard and has taught at Middlebury College. Her younger sister Chelsea works in Boston as a trial attorney. Dillon Teachout, the fourth-born daughter, is a social worker living in Maple Corner. And Cabot, the youngest child and only son of Peter and Mary, is a criminal defense lawyer in Norwich. The Teachout siblings are staunch traditionalists in some ways, their father said. He recalled that, as children, they all refused to watch the family's newly acquired color television because they were so fond of the old black-and-white set. And although she's characterized as a Sanders-style progressive, Zephyr espouses conservative Vermont Yankee values, such as "making democracy work as envisioned by the framers of the constitution — a democracy in which we can all participate meaningfully," Peter Teachout said. He also revealed "a couple of lesser-known bits about Zephyr." Dad said she's a talented artist and an enthusiastic poker player who "drinks her Scotch straight." And after getting her double graduate degrees from Duke, she cycled across the U.S. from east to west — "against the wind," he pointed out. Zephyr is nothing if not feisty. She leaned in at the Woodstock debate, punctuating her self-confident presentation with toothy smiles. Railing repeatedly against the influence of big money in politics, Teachout promised to work relentlessly to break up "the big banks and Big Pharma." She assured her listeners: "I have a lifetime of fighting tough fights and winning." Describing her likely Republican opponent as a lobbyist and political insider who's supported by a super PAC, Teachout declared: "I'm John Faso's worst nightmare!" Toward the end of the 100-minute debate she added, "I'm tough enough to take on John Faso and Donald Trump." Teachout would surely sting like a bee if she does make it to the U.S. House. And her chances look pretty good. Sanders carried the district by 18 points while losing to Hillary Clinton by 16 points in New York's April primary. And Teachout herself won in 10 of the district's 11 counties in her race against Cuomo two years ago. The district trends Republican, however, in congressional elections. Victory on June 28 and then in the November general election would come as no surprise to Nordin, who remains in regular contact with her high school classmate. "Zephyr stood out for her intellect and passion for ideas," Nordin remembered. "She was so far beyond what most high school students were thinking about." And she set her sights high. In fact, Nordin recalled Teachout saying she aspired to a particular office: the Oval one.